Generally speaking I take all of my photos during the day because I don’t like relying on special lighting equipment. But, sometimes due to schedules, extra gloomy days or otherwise, getting that “bright sunshine-y” daytime photo simply isn’t possible, which is why I’ve created this brief tutorial on how to take photos at night. This is by no means the only way to do it, it’s simply the way I prefer with the equipment I have on hand. So, modify as you see fit. While shooting at night can be a bit more challenging in some instances, with just a few tricks you can easily get a stellar shot without much effort and with very minimal equipment. I take my photos with our full frame Nikon d600 and a 50mm lens, which has the ability to function in higher apertures and let in plenty of light, which is great for night shooting (i.e. f/1.4 – f/1.8). (If you aren’t familiar with aperture, this is a great place to start.) However, even if you don’t have a 50mm lens, you can still adjust the settings on your camera to achieve similar effects, which I’ll get to below. 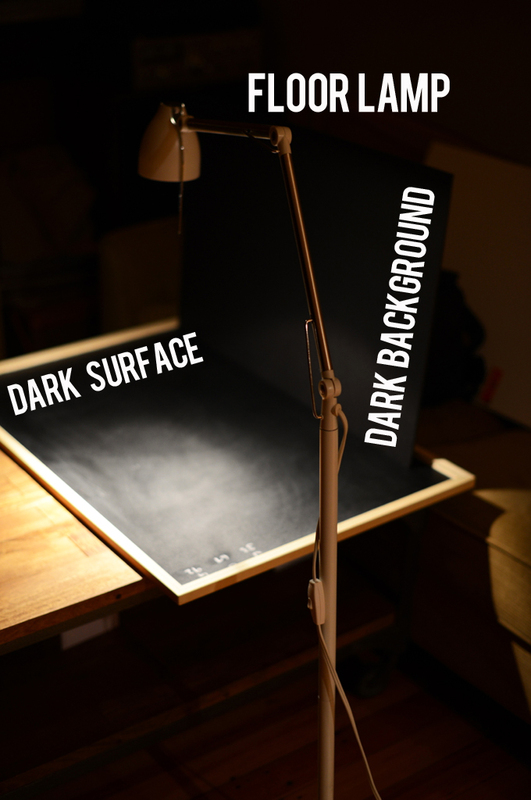 I chose to use my coffee table, a floor lamp, a chalkboard as my dark surface and a black poster board as my dark background. You don’t have to use a dark background or surface, I just selected them for this particular tutorial. The other thing you’ll need is a surface or object to bounce light with. 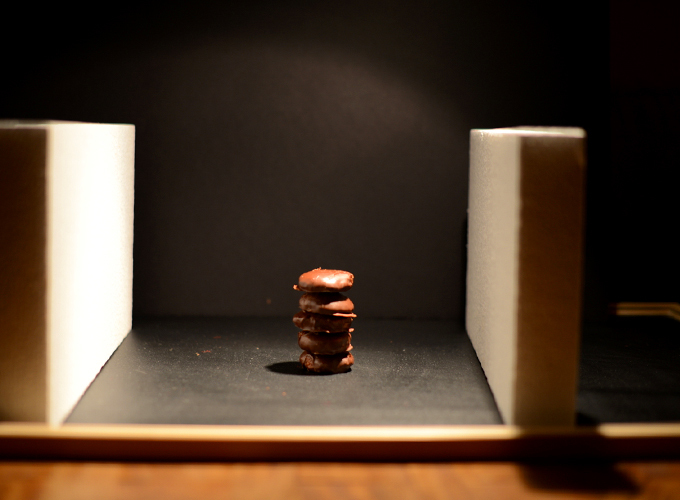 I use a rectangular piece of styrofoam, but you can really use anything: A white poster board, light-colored book, white wall – anything white that will bounce light onto your subject. As I mentioned above, camera settings can be tricky when shooting at night, especially depending on the camera you have. I haven’t tried shooting at night with a point and shoot, but if that’s what you have I would still encourage you to give this tutorial a try. Just keep your flash off so you don’t add more shadows than necessary. A high aperture (which controls how much light your lens lets into your camera) – f/2 is ideal, but just get it as high (note, as small of number) as possible. A slow shutter speed (which controls how long the shutter is open when taking a photo) so more light gets let in. I went with a shutter speed of 400, but that’s because my aperture was at f/2. If your lens isn’t capable of as high an aperture, decrease your shutter speed to compensate brightness. No flash, meaning get out of auto mode and into manual, aperture or shutter speed mode – whichever you’re most comfortable with. Now that your equipment is in place and your camera is ready, you’re ready to begin shooting. Play with your light to achieve different effects. I’ve included three different lighting effects in this post, but the options are abundant. You can cast very harsh shadows, aim for minimal shadows, or bounce light to really make your subject pop. Note: For the sake of providing realistic examples, all of the photos below are unedited. Below is the first example: Spotlighting. I call this approach spotlighting because it’s directing your light source almost directly on top of your subject, which creates a small shadow on the opposite side of your light source and reflects the most light on top of your subject. This looks a bit harsh for my liking, but it’s still a fine image. 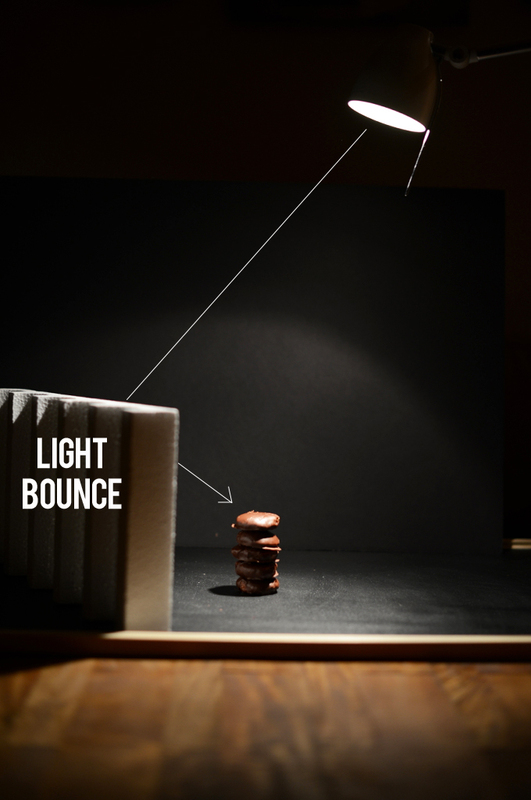 Let’s move onto the next example for a more subtle effect: Light Bounce. 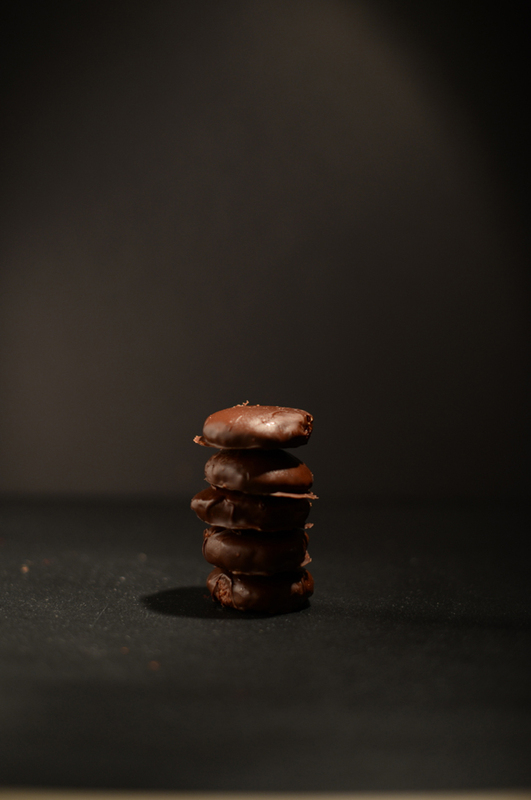 While the first image utilized a slight light bounce from the left side, the light source was shining more on the cookies. 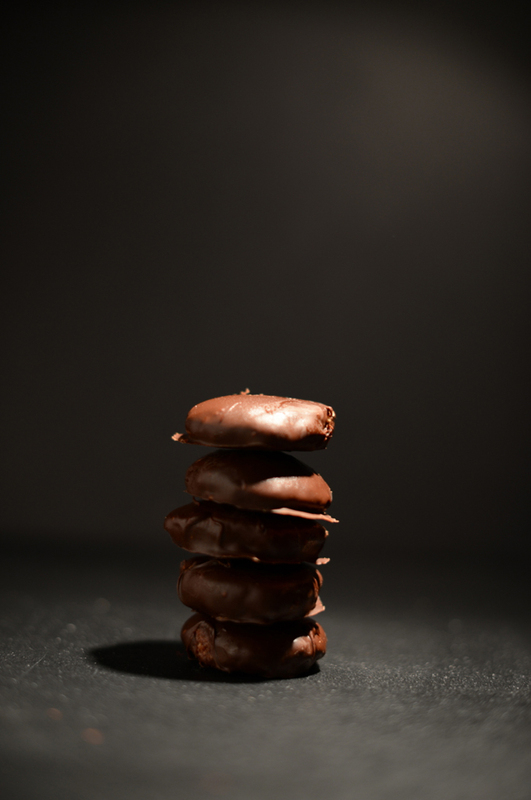 However, in this image we’ve shone the light onto the light bounce object more so than the subject, which casts less harsh shadows and diminishes that white spot on top of the cookies seen in the first example. This is a noticable improvement in my opinion, but if you want to lighten your image up even more try this next example. By placing light bounces on either side of your subject, light is bounced between them and onto your object, lessening shadows and even brightening the foreground and background, as you can see below. You’ll notice that the background is much lighter, as is the subject. The double bounce gives the image an overall brighter appearance without much additional effort. I personally prefer the second image because it seems to have the least harsh shadows and the dark background is still intact. See a side-by-side comparison of the three approaches to see which look you prefer. Again, all of these photos are unedited to show the actual effect each lighting approach gives to the photos. However, editing can provide vast improvements in lessening shadows/glare and sharpening the overall image. Learn “How to: Edit Dark Photos” in this follow-up tutorial. 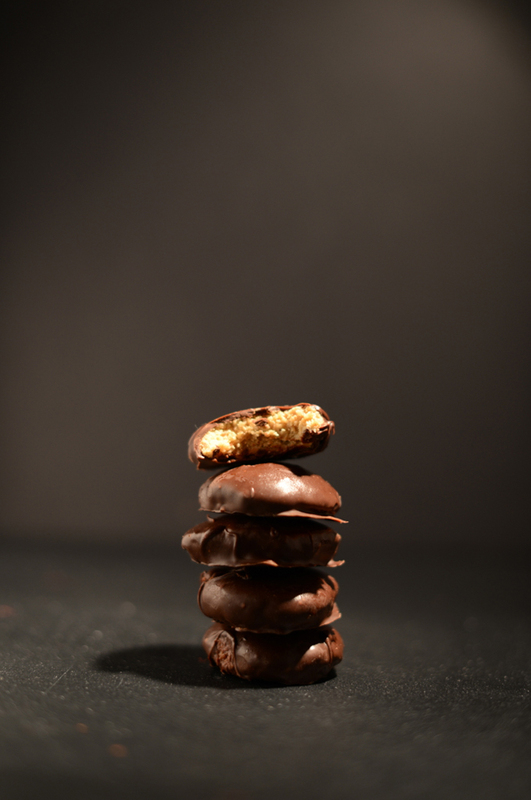 Also, checkout the Food Photography School! Wow! What a spectacular tutorial!! Now, it’s damn easy to shoot at night. This is excellent and so practical! Thank you for writing this tutorial, it is extremely helpful. what type of light bulbs do you use? Can you tell me a specific brand and type for artificial light during the day? Thanks Elizabeth! You can find our recommendations for cameras on our Camera Bag page. Hope that helps! this post was so helpful! Thanks for sharing. 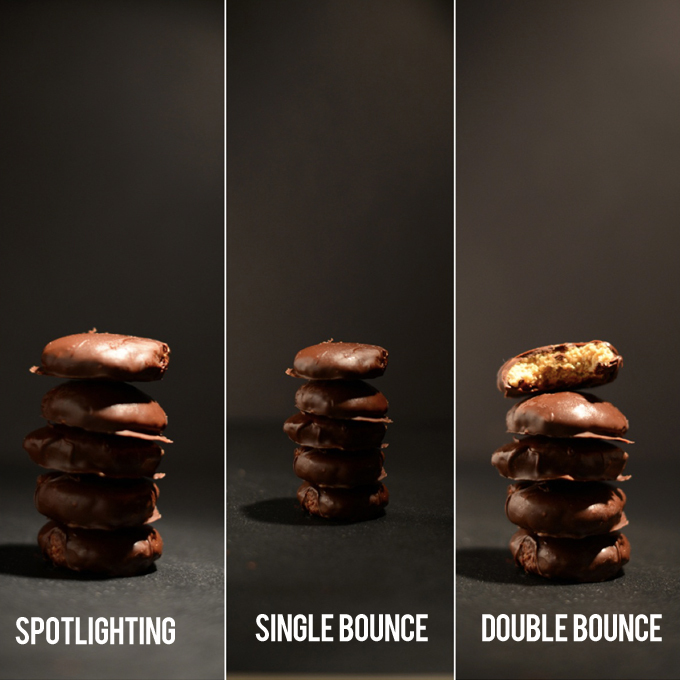 I love the tutorial, I love to ready everything about food photography and this one was very insightful.